So, Assassin's Creed Origins, eh? 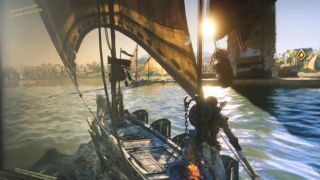 While Ubisoft has confirmed nothing about an Egyptian adventure - you could say that it's in a state of de-Nile - there's a ridiculous amount of conjecture, only supplemented by yesterday's screen leak on Reddit. Here's a quick breakdown of exactly what we know - or don't officially know - that makes this a potentially exceptionally exciting outing for the Brotherhood. Oh, and yeah, just look at the light in that screen.... Oh Assassin's, I've missed you. This has never been officially confirmed but is pretty much a dead cert. Last year we uncovered that AC Black Flag's director Ashraf Ismail was working on an unannounced project and had been since Edward's adventures. Not only had he once said that Ancient Egypt would be an interesting setting and that they had a way to do it, but all the recent rumours have said that the same team is working on the new project. Add in the fact that the name of the Reddit account who leaked yesterday's screen was 'Shoutouttoashraf' - before the name was deleted - and we've got quite a coincidence on our hidden blade wearing hands. Yesterday's mysterious Reddit poster also said "AC4 leads are working on this, most of the AC4 team." More seamless-ness - seamless-osity? - is promised. and given that Black Flag is still a gloriously loading screen free world, it'll be exciting to see what this means in an even bigger environment that clearly includes plenty of the watery stuff. Assassin's Creed Syndicate continued the modern day storyline after Unity neatly sidestepped it, but it's only really been ticking along in the background until now. When asked on Reddit whether there would be a modern day aspect, the leak poster revealed that there will be 21st century Assassin action and that "the modern day is gonna be very dope in my opinion and something to look forward to." This makes a big change as while it's been nice to wander around Abstergo entertainment - The Templars futuristic front for its nefarious memory stealing ways - it's always felt like the past is where the real action is. A modern day to be excited about hasn't happened since Desmond Miles was still alive. Oh, shhh, don't @ me. Now this is going entirely on what our mysterious Redditor has to say but "the game has smaller segments that take place in different times; the setting is the same though. A bit hard to explain without going into the story. It's not the helix rifts from ACU." Now this IS interesting. Syndicate managed to do this perfectly with the WW1 setting with Jacob Frye's granddaughter, Lydia. While London's set dressing was different, it was very much the same city and environment but with the bonus of London's Tower Bridge to synchronise with. If this is the same with an Egyptian city, going through different time periods will be incredible. Ok, now you have our attention. Prior to the Reddit screen leak, WWG revealed that Assassin's Creed Origins will have both male and female lead characters and that they will be in a world that's far more focussed on exploration than any Creed that's come before. Assassin's Creed has always been pretty cookie cutter in terms of its maps. Once you clamber up enough towers, you're good to tick every marker off like a murderous checklist. If WWG's source is to be believed then they compared it repeatedly to Skyrim which means far more freedom to play just the way you want. It's hard to know if just this extra year of development means Ubi could offer up a world comparable to Bethesda's but it's going to be ridiculously exciting to find out. The leaked screen shows a boat in action but according to WWG, there will also be naval battles returning to the franchise. While Egypt is the main historical location, boats will be back in a big way as we apparently sail the Mediterranean. If Black Flag is anything to go by, these won't exactly be pleasure cruises. Expect to be taking on enemy ships but also hopefully getting in some hunting on the ocean wave. Just no diving please, Ubi. I don't want to have to hold my breath as I get hunted by sharks. Again. Asssassin's Creed has been running on the Anvil Engine since day dot but we've had a stack of versions since the free running adventures of Altair. Unity and Syndicate respectively run on AnvilNext 2.0 - also, incidentally, so do Steep, For Honor and Ghost Recon Wildlands - and Origins sounds like its no different. Our trusty (not so trusty) Reddit poster says that it'll be on a "revamped" version of the Anvil Engine and that "a lot of changes were made to make the seamless transitions between cities/sea possible." We're hoping for a proper reveal sooner rather than later but rumours point to Ubi waiting until E3. I'll keep you updated.